Over the past week I had to rush to get a car due to my 2 Subaru Impreza Sport hatchbacks' leases coming to an end. I actually figured I would just get another one but my usual Subaru dealership changed hands and basically tried to rip me off. 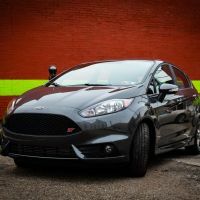 I had always been a fan of the Focus ST/RS and the Fiesta ST. Hot hatches at affordable prices (maybe not the RS). After only being able to find 1 Fiesta ST in all of Pittsburgh, I setup an appointment with a sales guy there. Within 5 minutes of being there and taking it for a test drive, I was hooked as soon as I felt the urgency of first gear. I fell in love. I needed it. We got back to the dealer and within an hour I was a new 2019 Ford Fiesta ST owner. The only other truly fun car I ever owned was a 2001 VW Jetta Wolfsburg Edition 1.8T with 16" BBS wheels and APS Tuning. This car trumps that one in almost every way. I can't believe I'm a proud owner of a Fiesta! But I really am. Thanks for having me! Since you got it brand new, check out the Octane Academy!! Thank you so much! I most definitely will. Yes congrats on getting one of the last ones and Welcome! Thank you all so much for the kind greetings! It is a good feeling to want to drive again and this car gave that to me. Also, the timing couldn't be more perfect considering it is going away and I have wanted an ST (Fiesta or Focus) for years. So, for my leases to be up it just happened perfectly. Still a crime that Ford cancelled it. She is quite photogenic, isn't she? First, CONGRATS and WELCOME from the other side of the state. And YES, these cars are one of the outright BEST looking 'hot hatches' out there, EVER, despite only being available in a 4 door version here.